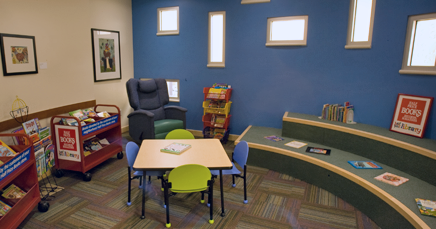 The Dell Children’s Family Resource Center Library provides information and support for patients, families and the community related to hospitalization, child health and parenting as well as information about pediatric health resources both at the hospital and in the community. By providing information and support to families, the Family Resource Center hopes to improve communication between healthcare providers and family members and increase understanding of patients’ health needs–ultimately leading to improved health outcomes for the children and youth we serve. The Center’s reference collection and links to online reference materials will include information on specific illnesses and conditions, growth and development, and nutrition and safety. Books and DVDs are available for checkout for a one-week loan period. Families will receive the support and guidance they need to find health information from a medical librarian. Requests for patient education and search services can be made by phone or in person. The Half Pint Library is located in the Family Resource Center. Children’s books, donated by various individuals and organizations in the community, are available for patients and their siblings to read. They can also pick a donated book to keep and take home. Special events such as Story Time and Pet Therapy visits are scheduled weekly. The Family Resource Center is located on the 3rd floor close to the main entrance of Dell Children’s. Hours of Operation are Monday-Thursday 10 a.m. to 4 p.m. and Friday-Sunday 12 p.m. to 4 p.m. For more information, call 512-324-9999 x 86727.